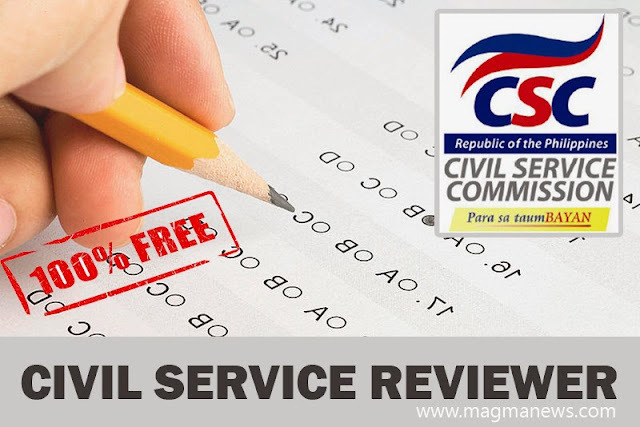 2019 Civil Service Exam Reviewer w/ Answers - Free PDF Download - Exam News, Reviewer, Military Career, & Everything [MN] . .
Are you one of the many individuals who wishes to land a competitive job in the government? Or have been working in the government, but is wanting to be awarded a permanent position or a regular status? Then you may want to keep reading and learn how you can acquire your most wanted jobs. Working in the government with a permanent or regular status means acquiring the many benefits and privileges that comes with it, these include higher salary rate, bonuses, paid leave and more. But getting such status requires more than just skills and scholastic credentials. One of the important requirements in order for an employee to be qualified by having a regular or permanent status is obtaining a Civil Service Professional Eligibility. This eligibility is acquired through a paper and pencil examination and is conducted by the Civil Service Commission (CSC). It is scheduled twice annually in different areas in the Philippines. According to the CSC, the Civil Service Exam for Professional and Sub-Professional Paper and Pencil Test (CSE-PPT) is a test that would test the readiness and competitiveness of an individual towards work and professionalism and their readiness to work with the government. The following are the qualifications and requirements that should be met when applying in Career Service Eligibility exam for both Professional and Sub-professional Level. 1. The exam is open to all regardless of educational attainment. Have not taken the same level of career service examination within three (3) months from last examination taken. Now that you have read the qualifications and other relevant information regarding the Civil Service Exam, you may want to equip yourself with information and knowledge that would help you pass the exam, go take a review. There are several review centers that offer reviews for CSE. But if you are too busy to go to a review center or your financial resources are not enough, you can always do a self-review with free Civil Service Reviewer you can have right here. We have compiled civil service study materials from various sources online which we think can be useful for you. Please read our disclaimer page before downloading. After downloading the folder to your PC, extract the folder to view the pdf reviewer files.